My name is Tom Antos, and I am a film director, cinematographer and visual artist. You can find out more about my work on my all-things-filmmaking website tomantosfilms.com. Today, I wanted to talk about my one year of experience with the Microsoft Surface Pro 4: how it works now versus when I first got it; and what are the good and bad things about this strange device. I use the Surface Pro to edit on occasion. Even though this device only has two CPU cores (like most ultrabooks), it still has handled 4K footage from the Panasonic GH4, G85, Sony a6300 and a6500. The trick, though, is that I have to reduce the video playback to one-fourth of the resolution. And if I apply effects, I sometimes have to render a preview. Also, when rendering the final video, it takes much longer than on a desktop or good laptop. So, you don’t want such a device as your main editing machine. Still, considering the amazing portability of this tablet-sized device, it’s great to know that in a pinch, I can even edit 4K video. My Microsoft Surface Pro 4 is a late-2015 model that comes with the Intel i7-6650U CPU, 256 GB SSD and 8 GB RAM. I call the Surface Pro a strange device because I am not quite sure what to call it. It’s not really a tablet, although you can use it like an iPad. It’s also not quite a laptop, even though it does run a full version of Windows 10 Pro. My Microsoft Surface Pro is a late-2015 model. It’s not a top-of-the-line model anymore, but when I got it (November 2016) it also was not the best. I have tested out the 2016 version for two weeks, but did not see much of an improvement over my Surface Pro. So why did I get the Surface Pro? First of all, I got it because I needed something that I could use to draw artwork on, and do storyboards for films. I also needed something for photo retouching. Before, I relied on a Wacom tablet to draw and paint in Adobe Photoshop. However, I really wanted something that would let me draw directly on the screen. Something that felt as real as drawing or painting on paper. The pen that the Surface comes with is great. It feels really well when drawing, and it is as sensitive to pressure as any other stylus I’ve used. The one advantage of pens you can get for the Wacom tablet or iPad is that they can measure the angle of the pen to the surface. The Surface Pro doesn’t do that, but honestly, for the kind of artwork I do, I never really used that feature on my Wacom tablet. I think that unless you are planning on doing fine art or digital painting, the functionality of the Surface Pro is all you need. The pen magnetically attaches to either side of the screen. Another thing I like about the Surface Pro is its size and weight. The screen is just perfect for drawing. It’s about the size of a normal sheet of paper, yet it’s thin. Even the power supply it comes with is tiny. The power plug uses magnets, so it attaches easily and stays in place. But if you yank on the cord by accident, it won’t pull the whole device with it. Surface Pro starts up quickly and allows me to sign in without having to type anything, since the front facing camera works amazingly well with facial recognition. It recognizes me or my wife and signs into our accounts right away. This feature has spoiled me, because now I wish all my phones and PCs would do the same. My Surface Pro has a few scratches to show for a year’s worth of heavy use. However, it works just as fast as the day I got it. That’s not something I can say about some of the laptops I’ve owned in the past (like most of you know, with time laptops and PCs tend to slow down). The Surface Pro is fast enough to do your everyday web browsing, watching videos, writing emails etc. It also works well when doing more graphic and CPU intensive tasks such as photo retouching. In Adobe Lightroom, for example, I like how responsive it is when adjusting the settings, and when using the pen – even when working with 40 megapixel RAW photos. I recommend getting the Surface Pro with the keyboard (although you can use it in tablet mode with the virtual keyboard). The original Microsoft keyboard feels great, is thin, and works well as a screen protector. With the keyboard attached, I use the Surface like a normal laptop. My Surface Pro uses Bluetooth 4.0, so I got a Microsoft mouse that takes advantage of this connection. With the mouse and keyboard, I can even use Adobe Premiere and edit 4K footage. Don’t expect to be able to run full resolution footage in Adobe, but at half or quarter setting, it works great. I use the Surface Pro when I am on location filming and need to back up the footage; or edit a quick video for a client, etc. I can even edit 4K video with simple color grading effects like Lumetri color. When I want to do some painting, I normally detach the keyboard and put the mouse aside, so that I can use the device like a piece of paper or canvas. The back stand allows me to put it at any angle. With Photoshop or my favorite painting app called Sketchable, I almost forget that I am using a computer. The brushes I have at my fingertips and the different canvas texture options really make it feel as if I was back in an art class – yet with the convenience of doing everything digitally. If I make a mistake, I can undo that. If I want to do a quick outline drawing and then on top of that do a final pass, I can use the layers to separate each pass. It’s just so much easier to work in a digital medium. The screen is also a touchscreen, so I can use my fingers to paint or operate the program. The hand rejection works well, so when I rest my palm on the screen, there are no unintended reactions by the device. I often do photo retouching in Adobe Lightroom. Again, with the pen it’s so much faster to paint over mistakes, or adjust parts of a photo. I honestly prefer to use the Surface Pro over any of my PCs or laptops when working in Lightroom. Also, because it is a touchscreen, I can quickly navigate around a photo and zoom in to work on specific parts of an image. So with all these wonderful things about the Surface Pro, you might be wondering what is wrong with it? Well, surprisingly there isn’t much. Even after a year of heavy use and travel, it still works just as fast. Now, where it starts to slow down is when I do really graphics intensive work for a long time. Painting or photo retouching has never been a problem. But the first time I edited 4K video for a longer period of time (over three hours), I noticed the Surface Pro got a lot hotter, and the fans at the top of the screen started working (otherwise I would never hear the device). So, if I continue to work past the moment when the device gets hot and the fans get loud, everything starts to slow down. 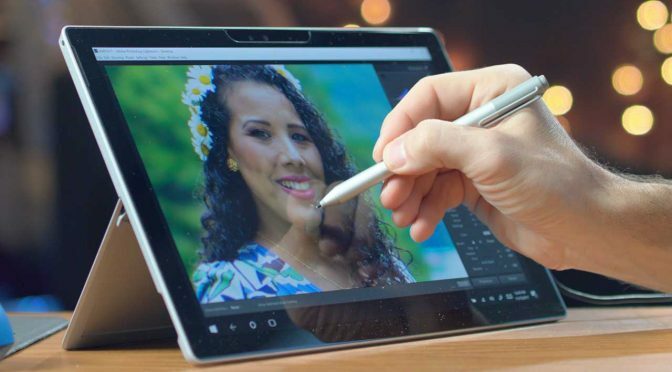 In one case when I was editing a video while on a vacation in the tropics, it took only two hours before the Surface Pro got so hot and slow that I had to take a break. I ended up going to an air conditioned place to continue the work. I wish that Microsoft offered a bigger internal hard drive – without charging an arm and a leg. So, one of the first upgrades I did was to buy a microSD card to expand the storage. Also, the Surface Pro only has one USB 3.0 connection and one Mini DisplayPort. There are is no SD card reader either. So if you plan to connect more than one device, or copy footage from your SD cards, then I suggest getting a USB hub that has both a card reader and a USB 3.0 splitter (like the one I show in the video). There is also another version of this I got that has an ethernet connection. If you want to connect to a TV, then you will probably also want a Mini DisplayPort to HDMI adapter. These accessories might seem unimportant, but in order to be able to use the Surface Pro as a laptop, you really need to get these extras (I wish Microsoft included them in the package). Another thing I got for my Surface Pro is an external battery pack. Mine has the correct voltage and also the Surface Pro cable. The Surface Pro will run for about 6.5 hours during regular use (ex. web browsing), but the battery dies significantly faster once you start doing photo retouching or video editing. With the battery pack, I get about four extra hours (give and take, depending on what you are doing). As a bonus, you can use the battery to charge your phones. So, am I happy with my purchase of the Microsoft Surface Pro? Yes! Would I recommend it to other artists? Definitely. Not only that. I think the Surface Pro is a great all-around laptop for anyone who needs to do general computing, but doesn’t want to carry around a heavy laptop. I can fit my Surface Pro along with all the accessories in a small bag (as shown in the video). In fact, this is how I’ve been carrying my Surface Pro for the last eight months.